** NEW ENGINE INSTALLED AND COMMISSIONED JUNE 2018 ** MAN V12 with full warranty transferrable. 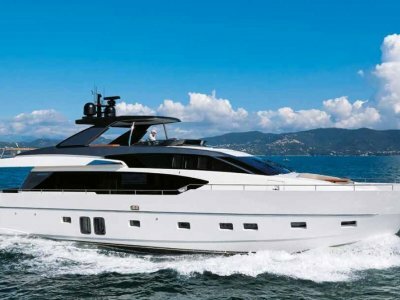 This stunning 86-foot vessel offers luxury and comfort for the owners and their guests, the interior being custom designed and created by Guildmaster Furniture and both the accommodation and main decks and finely crafted spiral staircases finished with finely crafted Honduran mahogany and exceptionally detailed craftsmanship. From the jacuzzi on the flybridge, huge open deck lounge and flybridge dinette, to the breakfast bar, dinette and saloon lounge with electric fireplace, galley with 2 stoves, downstairs to the 3 staterooms each with ensuite, separate office (convertible to 4th stateroom), full size laundry, and self contained crew quarters, there is nothing wanting in this stunning vessel. She also has full walkaround decks, a 12.5ft long enclosed aft cockpit, with a secure transom gate leading down to the solid teak swim platform. Amnesia IV is a world cruising, ocean going vessel utilizing state of the art fuel efficient design technology. Extensively model tested at the University of British Columbia, Canada, tank testing facility, this hull form is designed to perform exceptionally well in a seaway. She exceeded tank test results in the actual open ocean, heavy weather cruising en-route to California, not long after the initial launch. 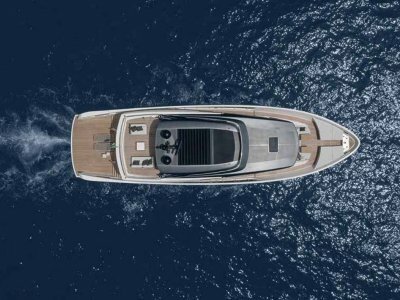 Built to ABS Class 1 Certification, by Master Dutch yacht builder Hans Staals, for unrestricted ocean use and extended offshore cruising,the hull form and bulbous bow are fourth generation technology. The detailed model test results were used to optimize the proportions of the vessel and combine many years of design work. 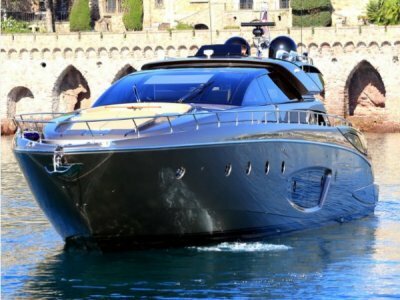 The vessel features a round bilge, full displacement hull form with fine entrance and flattened stern sections, incorporating a shallow draft positive flow propeller tunnel for protection. The controllable pitch propeller maintains ultimate prop efficiency over a wide range of speeds, wind and wave induced loads. The unique bulbous bow is designed to dampen pitching and increase fuel efficiency. The single 1300 hp MAN diesel with a large diameter 45" (CP) controllable pitch propeller, provides optimum performance and fuel efficiency, making this vessel up to 30% more efficient than the average cruisers. 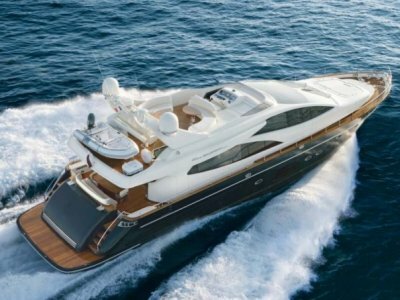 An hydraulic "get home" propulsion system onboard provides extra piece of mind. 45" Bronze 3 blade ZF controllable pitch propeller. (spare blade). Positive flow propeller tunnel. Zero degree propeller shaft angle. Two 30 kW 75 hp John Deere Power Tech model 4039DFM generators. #1 has 3761 hrs and #2 has 1343 hrs as of April 23/17. • Full-size couch with Stylish end tables lamps and coffee table. • All windows are opening and can be locked securely on sliding SST brackets. • Full entertainment center cabinet in the aft Port corner. • Aft full height clothes closet. • The overhead throughout the vessel is imitation suede. The FULL beam master stateroom is located approximately amidships for maximum comfort when underway in rough weather. It is exceptionally large and beautifully finished in Honduran mahogany with 3 large opening portholes to Starboard, all with secure deadlights. A separate lounge area, an en-suite vanity with his and her sinks and jacuzzi tub, enclosed shower, opening porthole with secure deadlight and Royal Flush electric toilet. A spacious walk-in closet with plenty of his and her shirt & blouse shelves, dinner jacket and dress hanging space along with shoe racks. Built-in vanity table features custom curved makeup drawers. Next to the master stateroom is a spacious, 8.8' x 7.7' office or crafts room with ample shelving and storage. This space could be converted to a 4th stateroom, master library or other personal use. All spaces have complete heating and air conditioning individual digital controls. Located forward to Starboard, with a Queen bed, private 3 piece en-suite with separate shower enclosure, and Royal Flush electric toilet. Honduran mahogany clothes closet and drawers, bedside tables with 110-volt lamps and plug-in receptacles. Both stateroom and en-suite have opening portholes with secure deadlights. All spaces have complete heating and air conditioning with digital controls. To Starboard a single lower berth 84" long and to Port one lower berth plus one upper berth, both 84" long. Berth's have double reading lights. Private 3 piece en-suite with Royal Flush electric toilet. Two opening portholes with secure deadlights. Complete heating and air conditioning controls. Full height clothes closet beside Starboard berth, drawers under each berth, plus large forward cabinet. Located aft of the engine room on the same deck level. Access is from the Starboard walk-around main deck, via a water tight door, down several steps. The crew quarters are full beam, 6'- 6" headroom, with a queen bed and private 3 piece en-suite, including a Royal Flush electric toilet. 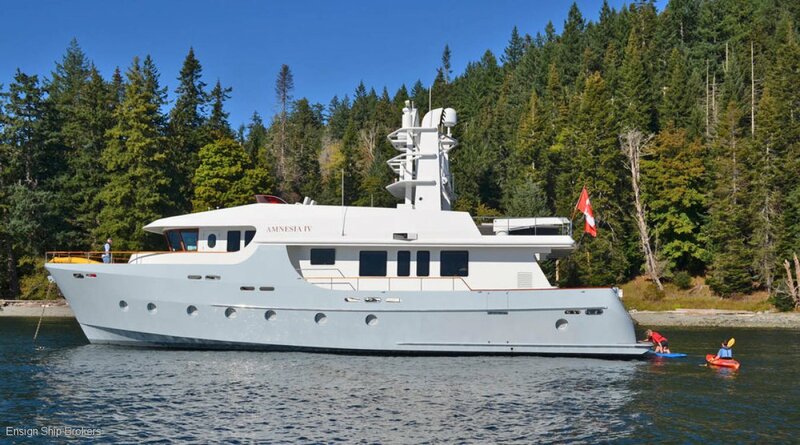 To Starboard is a full galley with refrigerator, 3 burner electric stove w/oven, sink, and dinette. Port and Starboard opening port holes with secure deadlights. LAYOUT: Located to Port, aft of the pilothouse has an open design with stainless steel full-size appliances and granite countertops, extra cold storage,providing the perfect environment for creating memorable meals. (2) 600 US/gpd Village Marine water makers. ANCHOR WINCH: Muir 8000 lb 24v anchor winch. CHAIN: 350 ft of 3/4" galvanized hi-tensile chain. SPOTLIGHT: RCL-100 Point Pad 360 degree search light. To Starboard beside the storage, cupboard is an approved main deck firefighting hose stations. A second firefighting hose station is to Port of the Portuguese bridge gate. Engine room fire suppression system. RADIOS: (2) VHF radio's, Intercom system, Iridium satellite phone.